As I was saying in the first part of the Controlled Golf Swing discussion, timing can be more important than the mechanics of a swing. Let me illustrate this statement with the following example. I was once watching, with a student of mine who had a most perfect golf swing, a fellow whose action was not pretty  to put it kindly. But he kept hitting nice long shots down the middle. "Not much to look at," I remarked to my student. "I would not care a damn what I looked like if I could repeat like that chap!" he replied. The awkward one could repeat his best shots time after time. His mechanics were ungainly but his timing was near perfect. Well, you may say, if that is so, why should you go to so much trouble to give us a good mechanical swing? 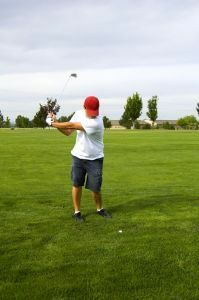 The answer is that good timing plus a good golf swing is better than good timing plus an awkward swing. The best swing, mechanically, is the one that pulls the ball a little and then makes it turn a bit to the left at the end of its flight, but if you get your maximum golf happiness out of a swing which slices the ball all around the course, there is no reason to alter your mechanics! If you do want to make an alteration, it may not be an extensive one. I remember one day at St. Cloud an American came and begged me to give him even fifteen minutes  which I did out of my lunch time as he seemed so insistent. His trouble was that every now and then his iron shots to the green would finish in the bunker to the left of the green. For three years he had failed to find a permanent cure. So on the advice of a friend he came to me. It did not take me long to see what was wrong and to explain to him that now and again his foot-and-leg work was sluggish, and in consequence the club head came in too soonto put his ball a little to the left. After that brief lesson I never saw him again, as he was on his way back to the States from Paris. But he left me a note of thanks and a handsome present, and when I inquired of the caddy who had been out with him in the afternoon learned he had broken 70. Some time later I saw his photograph in the American Golfer with the news that he had won the West Coast championship!